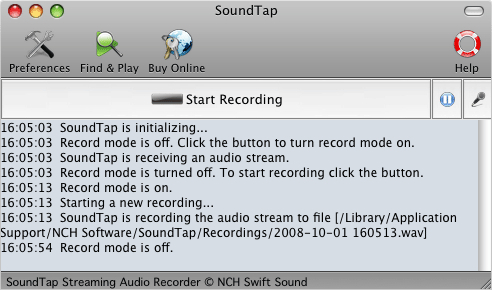 SoundTap Streaming Audio Record for Mac 2.21 - Download Win Apps. Record streaming audio from MAC OS X to either wav or mp3 formats. SoundTap lets you record just about any audio that plays through a Mac OS X including streaming radio, VoIP calls and Instant Messaging conversations. Simply install this software, turn it on and then all sound played on or through the computer will be recorded as wav or mp3 files. All audio is 'tapped' by a virtual driver directly within the kernel so the process is perfect digital quality.